Perhaps not quite a nightmare, we're too insignificant for that. In September we had 88 mm of rain on one day between 8 a.m. and 4 p.m. My vegetable garden and the orchard looked like swimming pools - shining sheets of water with circles of ripples as the last drops fell. An hour later there was no water anywhere. It had all been absorbed by the light sandy soil that had been crying out for a good soaking for months. I went out and walked around the vineyard which is mostly on sloping ground. Even better than in the garden. In a year's time I'll be drinking that downpour! I decided to have a look at the meteorological site on internet. The general forecast for the island was that we should be in brilliant sunshine with one or two fluffy white clouds. I checked the numerical models on the same site. Anyone with a little knowlege of our village, El Pinar, could have seen we were in for rain. Our rain usually comes on westerlies or occasionally from the south. Besides, a day or two before the sea had been white like a lake, a sure sign of rain. The Trade Winds were coming in from the northeast but there was an area of low pressure to the west and moisture-laden winds were curling round the west and south of the island. You see, the weatherman in his office in Madrid has in front of him a flat map with contours drawn on it, not mountainous El Hierro. Curiously, in El Pinar we get almost as much rain in a year as East Anglia. But we get it in a very few days in autumn and winter. From April or May not a drop until September at the earliest. That's why almond trees grow so well, and apricots, grapevines, figs, plums and nectarines. All these need dry, warm summers and have long taproots that go down deep, or are grafted on rootstocks that do. 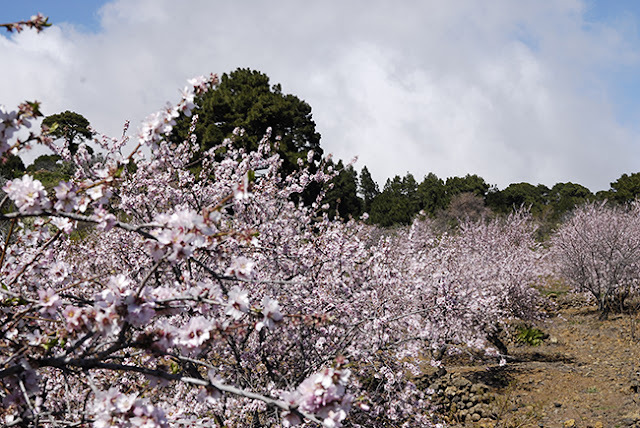 The almond trees flower in February - the countryside is invaded by white and pink blossom, the petals falling like snowflakes and the air pungent with the scent of honey-blossom.